The Awesome Author Challenge is hosted by Alyce at At Home with Books. 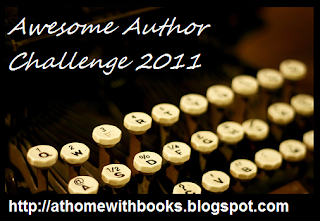 The challenge starts January 1, 2011 and ends December 31, 2011. Read works from authors that are completely new to you (you haven't read any of their writing before). Read books that have been recommended by friends, bloggers, or books that have been on your TBR forever because you have heard that the author's writing is fantastic. Crossover from other challenges is allowed. Choose the level at which you would like to participate, post about it and come back and leave a link to your post in Mister Linky. There are three possible levels for this challenge and I am going to sign up for the second level: 6 to 10 books. I figure that will get me to make a dent in my TBR shelves (though not a big enough dent). I am not sure what books they will be yet, but I am excited about it since most of the TBR books that stare me in the face on a daily basis are ones that were recommended by my fellow book bloggers as awesome (see that tie-in?!). Good luck with the challenge! Thanks for joining! Ayce--I am excited about this challenge; thanks for hosting!